Custom-designed for families, the Camperworld Family Cruiser makes it possible for you to take your whole family on holiday in comfort. 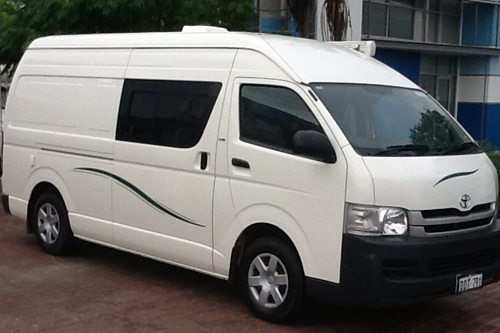 The vans are legally allowed to carry 5^^ people (much more than other vans) and the beds inside the van are both on the lower level, meaning there are no top bunks for little kids to fall out of. And if you need extra bedding for older children, or indeed mum and dad, we’ll happily supply FREE camping gear and bedding to go with your camper van. 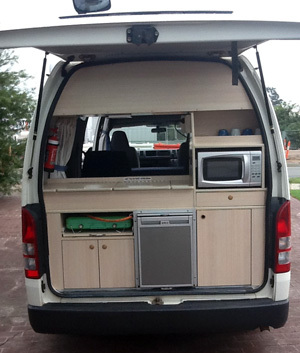 Our customers love the outdoor kitchenette (a real plus)… cook your dinner, relax and eat under the 3 metre awning. Fantastic! Seating includes 3 Front Seats + 2 Back Seats. IMPORTANT: Children must be over 7 years old to travel in a front seat. Vans seat 3 people in the front cabin and 2 people in the back. Children under 7 years old cannot travel in the front seat. Beds 2 double beds. 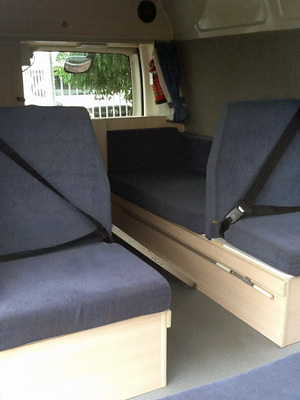 ( 1.9 X 1.67 m and 1.94 X 1.36 m) Both beds are on the same level, inside the van. ^^IMPORTANT: Vans seat 3 people in the front cabin and 2 people in the back. Children under 7 years old cannot travel in the front seat. Children must be 7 years or older to travel in the front seat. Click here to read more.